The Learning Curve Home of FiddleStix Quilting: May Giveaway Day!!! GIVEAWAY IS NOW CLOSED WINNER TO BE ANNOUNCE SHORTLY. I am participating in May Give Away Day because I just couldn't resist joining in and having all this fun celebrating with Sew Mama Sew's May Giveaway Day! And one of you will be the winner of your own personal 1st edition copy of this new magazine. That’s 2 possible entries! Enter now through Friday morning, May 25th. Mr. Random.org will pick the winner and I will announce their name in a new post here on the blog. Fun prize! Thanks for the chance to win it. :) I tried following all of the tweets, but goodness! there was such excitement about everything that there were about a million to go through. Sounds as if it was a great time with lots of great things to see. I couldn't follow ALL the tweets, hehe about Market but I did follow some as well as some posts showing great pictures. So many pretty quilts, fabrics and booths. Looking forward to seeing more if I can. Thank you for your giveaway Jeanne and a chance to win. You are always so generous to your followers with your giveaways. thank you Jodi for always being my champion! I followed part of them. Life was a little hectic this weekend, but I was wondering about the tornadoes in that area. there were 17 tornado's and all of them were within a 3 hour time frame away from KC and they were definitely headed to KC. I followed as much as I could on FB. I was pretty busy this weekend so I'm hoping to catch up on all the news today via blog posts. The pics I did see made me jealous! And if you were jealous that would be a spot on description. Now that I have been to my first, I want to go to all of them. YES,I FOLLOW AS TIME+FAMILY ALLOW! LOOKS LIKE SUCH A FUN-TIME AT MARKET-THANKS ALL FOR THE PHOTOS YOU SEND! I didn't really follow the tweets, however I did keep an eye on flickr! I am already a follower Thanks, that looks like a cool magazine! I followed the tweets throughs Fat Quarter Shop and the hashtag #quiltmarket - even that was amazing. I can't quite imagine being there :-) Thanks for the chance to win a copy if this great magazine!! I am a new follower through RSS (Google Reader). I'm one of your lost followers but now I'm back againe. I followed a lot of quilt market by e-mail posts and some facebook. It looked like so much fun. I want to go. I followed the tweets from Kimberly Jolly, and you, and Heather of olive and ollie, and wished I could be there. I didn't follow the tweets and facebook because I am not on either but I did read lots of blog posts and wished that I was there. Sounded like an awesome weekend. Of course I am a follower. I found you early in my blog reading time and I still love catching up with your news and projects. I don't Tweet. Not sure if I ever will. I saw some other bloggers talking about it but was to involved going to HMQS here in Salt Lake to notice. I Live too far away to go to the quilt market. I have been sooooo jealuos of all the bloggy ladies who got to go! I have been drooling over all the pictures that have been post from the Market! I tried to follow the Facebook posts and pics, but sooo many. Oh, sooo many by so many great bloggers. Thanks for the chance to win. I don't do twitter or FB, but I did read LOTS of blog posts about market. It looks fun and exciting and overwhelming and exhausting all at the same time! I agree that the amount of beautiful fabric coming out is mind boggling. I'll bet GenerationQ is a great magazine, thanks for the chance to win. I followed partly on facebook, but there was so much! I'm looking forward to reading all the blog posts about it! I enjoyed looking at lots of pictures from Quilt Market. It looked like an amazing event. The different booths looked fantastic and inspiring. Lots for us to look forward to! I have not been following along with quilt market except what people post on their blogs! I can't stand facebook or twitter, but I enjoyed following blog posts. I haven't really been following the quilt market, I'll just enjoy seeing all the new lines when they're officially released! Thanks for the chance to win! I followed a lot of it on FaceBook and of course the blogs, it always looks like so much fun. Thanks. I didn't really follow the posts about Quilt Market but I am really looking forward to seeing all of the wonderful new fabric releases! Thanks for the chance to win! So looking forward to that magazine! I did follow some of the quiltmarket news on Twitter. There's just so much! I followed along with pictures on Flickr and then read people's blog posts. Super excited about all the great fabric! I followed a lot of the Market tweets and also pics on Instagram that were posted by Tula Pink and Camille Roskelley, as well as other bloggers who got to go. I didn't follow anything. I saw it on a couple blogs. That's about all. You bet I kept tabs on all those photos streaming in from quilt market! I would so love to go but know how lucky I am to have friends who go and post amazing photos. 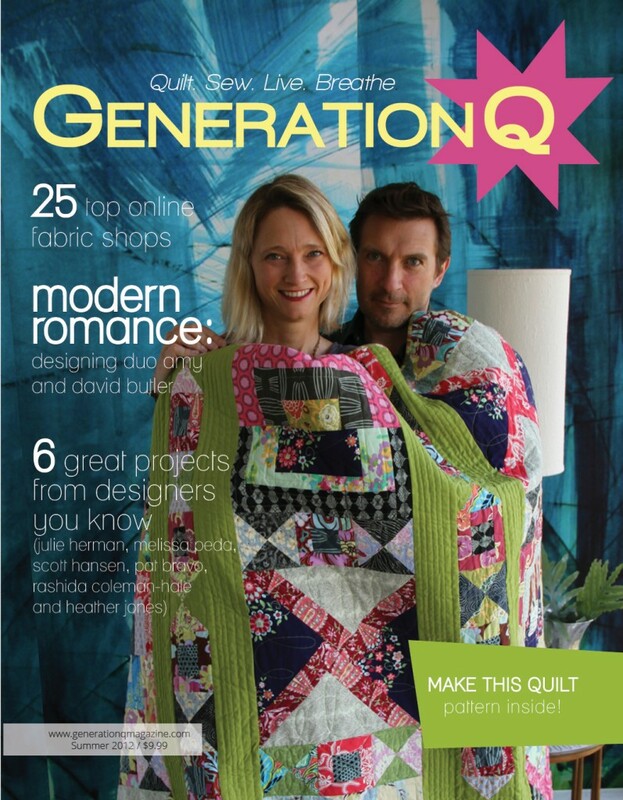 I would love to have this magazine...my friend Heather has a quilt in there and I saw a picture of it hanging in the Gen Q booth. Glad you had a good time at Market. I tried! But it was almost impossible. My google reader exploded between quilt market and then giveaway day, I haven't even made it through a 1/4 of the posts in there! Great giveaway and I followed some blogs that showed the Market. I was so far behind last week, I just didn't follow anything on twitter... I'm still behind, but entering all these wonderful giveaways instead! I didn't follow because that is a whole world away from me. I however want that magazine, with Amy and David on the cover, looks very interesting. I didn't follow Facebook or Twitter but I've been reading blog postings about it...it sounds like a lot of fun I missed. I am itching for some Liberty fabrics now that everyone who was at the market is crazy about them. Thanks for the chance and I love your blog background. Very chic. I followed lots of blog posts from Quilt Market, it looks so fanastic & it's great to see all of the photos & read about designers & new fabric lines. You're so lucky to have been there! Thanks so much for the lovely giveaway. I now follow your blog via email subscription. Thanks again. Wow this does look like a great magazine - especially with the Butlers on the front! I read a few posts and could feel the excitement and sooo wished I could have gone (not even sure if a mere mortal like myself can go??) but maybe one year I can fly over and sneak in!!? No I didnt follow any tweets but am hoping to see lots of photos and booth pictures on blogs of folks who attended. I did not follow any of the Tweets - and have not looked at my Facebook page for messages, but I am reading every single blog entry I can find, and looking at all of the photos as well. So great that you were able to go! I'm from Australia so I wasn't sure what Quilt Market was but I have sure seen a lot posted about it on all the blogs lately! Looks amazing! I follow FAt Quarter shop on FB--they always have about 200 pictures per day! I did follow a few people, just on FB and blogs, not on twitter. I don't tweet, I did follow several blog posts of market because I love to see the booths with all the designs and fabric. I read them on Facebook mostly. I truly enjoyed reading all of the posts and seeing the photos from Quilt Market. What a wonderful and probably overwhelming experience (all that color!). Thanks for the chance to win this new magazine! And I'm very excited to read the new Gen Q magazine! I didn't manage to read everything from quilt market! not enough time! I didn't follow any of the buzz about Quilt Market, though I'm enjoying reading reports afterwards by various bloggers I follow. I do not have Facebook nor do I tweet or twitter, but I did follow along on several Blogs. Thanks for the awesome book. I didn't follow anything on FAcebook and I do't do Twitter. I only saw blog reports of the new lines. I don't use twitter, but I've seen a bunch of blog posts from people that went and everything looks fabulous. I do not have twitter or facebook, although having everyone talk about it makes me think I need to jump on the bandwagon. I've only recently seen some blog posts and I am loving all the new fabric and trends...very modern! Thanks for the chance to win! I saw a few tweets about market but not all that many actually-I'm excited to see all the new fabrics though! I did not and was not even aware of the market until I am following this bloghop and hearing all of the excitement. I hope to one day attend the Houston Quilt Market (I live in San Antonio). I haven't had a lot of time to browse lately but am excited to read about market. I loved seeing all the blog posts about Market- such pretty fabrics! I didn't follow all the tweets but now I wish I did! I wasn't able to follow the tweets but I did read on Flickr and scanned photos.....wow....it's always been a dream of mine to go! Aghh! I would absolutely LOVE to win a copy of this magazine...I'm obsessed with quilting magazines.....I'm crossing my fingers! I'm not on Facebook or twitter(I know,I know), but I did follow on some blogs. I did not follow the show. But it has been mentioned often I should have. I tried to follow it but wasn't successful life got in the way. I didn't follow the tweets or FB, but I have seen some post-market blogs since then! I didn't follow the tweet or on FB, I get to know from blogs in the blogland. Didn't follow a single tweet or FB post. I actually didn't follow Twitter or Facebook for Quilt Market updates, but I do follow the blogs of lots of the people who did attend and I am slowly starting to see the trickle of photos taken while there. :) Thanks for the chance! I'm not on Twitter or Facebook, but there was enough about Quilt Market in blogland to whet my appetite for sure! I did watch all of the posts on the 100 blogs that I follow. . .. I am a new RSS follower! I kind of forgot about it until I started seeing blog posts about it all over the internet. I am so inspired by the pics posted from the event. I did not even try to follow it. A little crazy! I would just love to go some time!! I did not follow on twitter or FB but did read along in peoples blogs. I've been following all the blog posts about market - I love seeing all the booth pics! I follow the Fat Quarter Shop on Facebook and they had awesome pictures of the Quilt Market - everything just made me drool!! I would love to win your extra magazine with Amy and David on the cover. Thanks for the give away! I didn't really follow it on FB and I don't have Twitter. I did follow a few bloggers who went but since I'm trying to use up my stash I'm not letting myself drool over the new fabrics too much! I didn't follow any of it. Why add insult to injury since I couldn't be there! I don't follow tweets or Facebook but I do follow about 100 blogs and you are right- there are many exciting lines coming up. Thanks for participating in the Giveaway Day. I have been busy with the last of school so I missed the FB posts about quilt market. It would be fun to get this magazine. I did follow a lot of the blog posts about market. I hope to go there someday! I'll be honest. I didn't even know about Quilt Market until I started reading all these Giveaway Day posts! I didn't see all the posts about it! Just what some people have mentioned after the fact on their blogs. I didn't follow all of the tweets and posts but I did follow a few and I did fall in love - I wish we had a quilt market like that here in Australia. It looks unbelievable. I do not tweet but did read lots is posts about the market , sure would have been nice to have been there. Thanks for the chance to win. I read lots of blog posts about quilt market. I love seeing all the booth photos! I have seen lots of blog posts on the Quilt Market, but don't tweet or facebook so no following there.